SafeEggs.com. 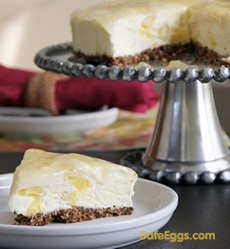 Following up on yesterday’s review of the No Cook, No Bake Cookbook, we have a no cook, no bake dessert for you: Pineapple Cream Cheese Cake. Cookie or cake recipes where you have the tendency to eat the batter before it’s cooked. 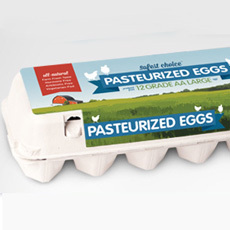 Here’s more about pasteurized eggs. The prep time is 35 minutes, freezing time is 6 hours. 1. COMBINE gingersnaps and panko in a medium bowl. Add melted butter and stir until crumbs are evenly moistened. For easy removal from pan, place parchment paper along the bottom of your springform pan before pressing in crust. Press onto bottom of 8- or 9-inch springform pan. 2. BEAT egg whites and cream of tartar in a medium bowl with an electric mixer, until soft peaks form. Gradually add 1/4 cup sugar and beat until stiff peaks form. 3. BEAT cream cheese and remaining 1/2 cup sugar in a large bowl, until smooth. If using a stand mixer, use the paddle attachment. Add egg yolks and beat well. Mix in pineapple and vanilla. 4. BEAT cream in another medium bowl until whipped. Fold egg whites into cream cheese mixture, then fold in whipped cream. Pour filling over crust and freeze until set, 5 hours or overnight. *If using a can of crushed pineapple for the torte, you can reserve the pineapple juice for glaze. 1. COMBINE sugar and cornstarch in a small saucepan. Add pineapple juice, and stir until cornstarch is dissolved. 2. COOK over medium heat, stirring, until mixture comes to a boil and thickens. Remove from heat, add the rum, and cool completely. 3. TO SERVE: Let cheesecake sit at room temperature 5 minutes. Run a knife around sides of cake to loosen and remove pan sides. Top cheesecake with glaze and cut into slices. Look for pasteurized eggs for any recipe with raw eggs. Photo courtesy SafeEggs.com. Alas, no, as can be seen from the recent outbreak of salmonella poisoning involving an ice cream product, reported food safety expert Dr. Robert Gravani, professor of food science at Cornell University, in The New York Times. Freezing just keeps the bacteria in a state of suspended animation. When they warm up (in the case of frozen cheesecake, when they hit the digestive tract), they come back to life.